A waterfront Palm Beach estate on Billionaires Row sold for $28.7 million, nearly $10 million off the asking price. Edward T. Holt, trustee of the Mary Hulitar trust, sold the 12,062-square-foot mansion at 980 North Ocean Boulevard. The buyer is Twins Four LLC, a Delaware LLC managed by Kochman & Ziska PLC. Hulitar and her late husband Philip, a fashion designer and artist, had owned the home since 1971. The sale is the largest in Palm Beach so far this year. 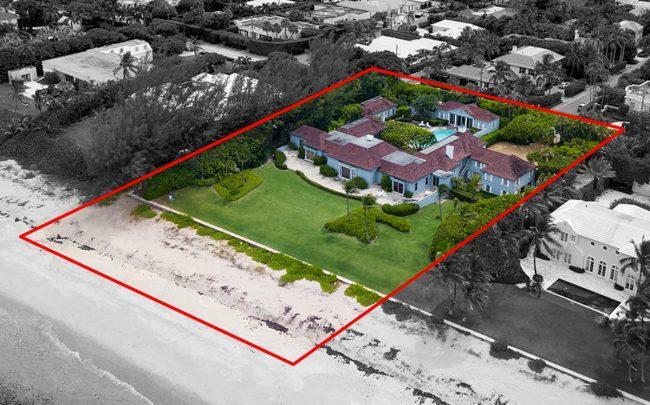 Last year, the most expensive residential sale in South Florida was also in Palm Beach, topping $41 million for the lakefront estate at 1485 South Ocean Boulevard. Ashley McIntosh of Douglas Elliman represented the seller and Lawrence Moens of Lawrence A. Moens Associates brought the buyer. The 1.5-acre property was on the market for $37.5 million, and sold for more than 23 percent off that price. The new owner already plans to demolish the beachfront house, according to the Palm Beach Daily News. The town’s architectural commission approved the demolition in March. The seven-bedroom, nine-bathroom and two half-bath house was built in 1947 for Philip Danforth Armour III, a Chicago meatpacking industrialist. The property has nearly 240 feet of beach frontage.